Panasonic ES-LT71-S Review 2018 - Is It One Of The Best? When it comes to buying an electric shaver, some men will pay any amount of money for the latest features, while others are always looking for a bargain while still getting a good shave. The Panasonic ES-LT71-S is one of the few rechargeable electric shavers that has many of the more technologically advanced features that you will find in high price shavers, but at a price that most men are willing to pay. What Is the Panasonic ES-LT71-S? This is a complete shaving system that includes arc shaving technology and a flexible pivoting head. It has a 13,000 CPM linear motor drive to ensure the best possible shave whether you are shaving wet or dry. The advantage of this kind of shaving system is that it allows all three blades to provide maximum coverage and closeness at all angles. These blades are made from nano polished, stainless steel and hypoallergenic materials that are tuned to a specific 30 degree angle which has been shown to cut hair at the best possible angle. 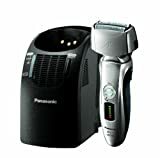 The pivoting head of the Panasonic ES-LT71-S makes it very easy for shaving around the jaw line, the neck, or under the nose, and because of the impressive speed of the motor, you should not experience any of the tugging and pulling that you may have had with electric shavers in the past. What Features Does the Panasonic ES-LT71-S Have? If you have suffered skin irritation or simply a poor shave as a result of using an electric razor in the past, then the Panasonic ES-LT71-S will provide you with the power and closeness that you have been searching for, but without any of the skin irritation. Because this razor is able to self-clean, it will always be clean and sharp, without you having to do anything. The blades in this model are stainless steel and hypoallergenic and the entire device is completely waterproof, which is important for wet shaving and also makes cleaning it a lot easier. This comes with the recharger and travel pouch, and the Li-Ion battery which has an estimated usage time of one hour on a single charge. It can be charged worldwide, and comes with a full manufacturer’s warranty as well. What Kind of Reviews Will You See? Many of these reviews certainly mention the power and convenience of the cleaning and charging system and how much easier it makes taking proper care of a razor. Instead of worrying about when and how to charge your razor, this system takes care of all of that hassle. In addition to this being a completely self-cleaning model, it also has a reputation for providing an extremely close shave, whether you are shaving wet or dry. Having this kind of option means that you may finally be able to throw away all of your other razors and shavers. Where Can You Get the Best Price on this Model? You can get an incredible buy on the Panasonic ES-LT71-Sright now, on amazon. Don’t pay retail price for this when you can get it cheaper. You are not going to get a better buy on a high end, self-cleaning electric razor like this at your local department store. Is the Panasonic ES-LT71-S Right for You? There are certainly a number of features that you will get with the Panasonic ES-LT71-S that make it a very good deal, not least of which is that the cleaning and charging station that comes with this model helps to eliminate all the problems that are commonly associated with charging any shaver. Since this also has a five stage LCD readout to show you the current battery life, it is also a viable shaver for when you are traveling. If you have been looking for a technologically advanced, powerful, and effective shaver that will provide you the same level of closeness that you would get from a razor, then the Panasonic ES-LT71-S may be a good choice for you.